Preheat oven to 400° degrees and grease a baking sheet with butter. In a large bowl, whisk together Dip Mix, flour, baking powder, and salt. Toss butter into the dry ingredients until coated with flour. Working quickly using your fingers, rub butter into flour until it resembles coarse meal. Add milk and cheese and stir with a fork until it just comes together into a slightly sticky dough. Using a teaspoon or small ice cream scoop, mound walnut sized balls of dough onto the prepared baking sheet. Bake biscuits until golden brown, about 15 minutes. Serve warm or at room temperature. Makes 14 biscuits. – Add fresh minced onions to mixture before baking. 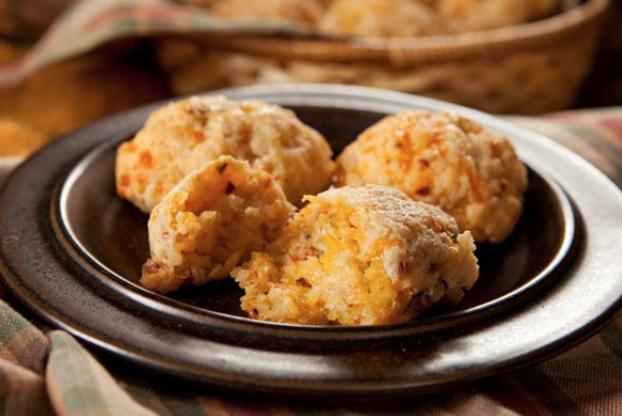 – Serve with honey butter or your favorite jam for a sweet savory breakfast biscuit!